With co-working spaces such as WeWork growing in popularity, real estate attorneys are frequently called upon to help clients navigate the pitfalls of shared space agreements. 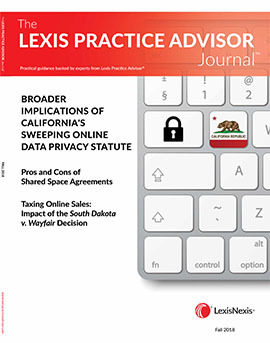 This article discusses shared space agreements generally, how these agreements differ from leases, advantages and disadvantages of these agreements from the user’s perspective, and considerations for counsel to both the user and the tenant/licensor. What Does a Shared Space Arrangement Look Like? Typically, a shared space arrangement takes the form of a large space within an office building that is broken down into cubicles, conference rooms, offices, and ancillary spaces (such as a cafeteria or a message center) that are shared by multiple users from different organizations. Users are allotted a certain amount of work space within the larger shared space, but the space is typically not separately demised (i.e., there are no walls or locking doors separating one user’s space from another’s). The space is usually fully furnished and operational, so all a user needs to do to start working in the space is sit down and plug in his or her laptop. Contracts governing shared space arrangements typically take the form of a license agreement (if not in name, then at least in substance), which is legally distinct from a lease. A lease is governed by real property and landlord/tenant law and is generally a more legally stringent and involved document. Pursuant to a lease, the tenant is given a real property interest in the premises for the term set forth in the lease agreement and receives the benefit of landlord/tenant law in the jurisdiction where the property is located. Generally, the landlord under a lease can evict a tenant prior to the expiration of the lease term only in compliance with the default and remedies provisions of the lease or pursuant to an eviction proceeding, which can be a lengthy process. Finally, since a lease is typically a large commitment and investment, landlords often impose stringent underwriting requirements on tenants and require substantial security deposits, guaranties, and insurance coverage to protect themselves. Shared space agreements are appealing to the user for many reasons, most of which come down to ease and simplicity. License agreements are usually short, simple contracts written in plain language rather than legalese. Licensees appreciate that licenses are easier to understand than leases, and negotiations are usually quicker because there is less to hash out. Licensing space is usually much less expensive than leasing space. Licensees can contract for exactly how many work stations they need rather than taking on an entire demised space, and it is usually at a much cheaper transaction cost. They often pay one flat fee that covers all other ancillary charges typically passed through to a tenant under a lease (e.g., utilities and common area maintenance). Additionally, there is less upfront cost in a license than in a lease because licensors usually require less (or no) security deposit, guaranty, and insurance coverage. License agreements are typically much shorter in term than leases and offer early termination options to both the licensor and licensee. Start-ups especially like the flexibility of licenses because often they are not able to predict their space needs over the long term and do not want to be locked into a years-long lease. Shared space providers frequently create a trendy atmosphere appealing to younger companies and often specifically catering to the Silicon Valley-type of user (imagine an open floor plan, lots of glass, and space for gaming and socializing). While shared space agreements provide ease and flexibility, these characteristics also give rise to several disadvantages that users must carefully consider. While licenses have much less onerous requirements than leases, they also offer fewer protections for users. Since a licensee does not have a real property interest in the space like a tenant under a lease would, the statutory and other legal protections that exist for tenants do not apply. Licenses are generally terminable by the licensor on 30 days’ notice or less. When representing the user, make sure your client understands that they should have a back-up plan in place in case their license is unceremoniously terminated. In a co-working environment, a user may be surrounded by other people in a large, noisy, and unpredictable room. Your client’s space might even be subject to unilateral relocation by the licensor, meaning that their agents are authorized to move your client’s personal property to elsewhere in the space. This arrangement might not work well if your client handles sensitive information, needs to have confidential discussions, or otherwise needs to be in absolute control over its data and communications. Any specific needs in this area would need to be carefully negotiated and perhaps set forth in a rider to the license agreement as discussed below. Users typically utilize the electrical and internet services provided within the shared space but have little to no control over the type of services provided or the hardware used. If you represent the user, make sure that your client is aware of this if they have heightened or particular needs, such as a virtual private network internet connection or Bloomberg terminal. Depending on the user’s industry, it may be subject to regulatory requirements that do not align with the short term, and sometimes ad hoc, nature of shared space agreements. For instance, some financial services entities may be required to provide lease documents to regulators to show they are operating in a legal space that they have the right to occupy. Depending on the formality of the license agreement, it may not pass muster with those regulators. As counsel to a potential user/licensee, your ability to negotiate the shared space agreement varies greatly depending on the sophistication of the licensor and the structure of their form agreement. For the most part, licensors offer space pursuant to a standardized license agreement that many users sign without negotiation. Often these agreements are short, very licensorfriendly, and modifiable without licensee consent. Corporate licensors are often unwilling to deviate much from their form agreements and have little incentive to do so when most of their users are easily replaceable, small operations with little to no bargaining power. Licensors without a large corporate umbrella may have more flexibility to tailor their agreements to a particular user’s needs. Note that, in most circumstances, the user and its counsel are not given the opportunity to review the licensor’s lease for the space. Termination. Make sure you understand when and how the agreement can be terminated by licensor and your client. Utilities and services. The license agreement should spell out which utilities and services the licensee will receive as part of its flat fee. Typically, these are utilities and services in the shared space. These items will of course be limited by what the licensor receives under its lease for the space. Ask for a rider. Many license agreements state that the licensor can amend them at will or are designed as rules and regulations that can be updated by posting them in the shared space. If that is the case, you should include any terms that are deal breakers for your client, such as the specific technological, confidentiality, or regulatory requirements mentioned above, in a rider or side agreement so that they will be binding. The popularity of shared space arrangements has created opportunities for tenants with space to spare to offer desk sharing as a sort of sublease lite. This is especially attractive to a startup client whose personnel needs may fluctuate, or who may need to lease more space than it can currently fill. If you have a client interested in this possibility, you can request during lease negotiations that the landlord allow a certain amount of square footage to be used for desk sharing. Failure to include a provision explicitly allowing the tenant to share space can result in a shared space arrangement falling under the assignment and subletting provisions of the lease and requiring the landlord’s consent. Users may not have any signage rights. The space will not be further demised or altered. The number of users in the space is limited. Use must be in accordance with the lease. Thus, at the lease negotiation stage, the tenant should request a broad permitted use such as general office use rather than a very specific use that might make it difficult to find an appropriate licensee. A default by a space user will be deemed a default by the tenant, and the tenant will need to take steps to cure. Users may not be charged more than their allocable share of the rent for the entire premises. Daniel A. Suckerman is a resident in Lowenstein Sandler LLP’s New York City and Roseland, New Jersey offices. He represents a broad range of clients in commercial real estate transactions, including acquisitions, leasing, financing, negotiation of joint venture agreements, and matters relating to asset management. Daniel’s practice is national in scope and crosses all asset classes, keeping him on top of commercial real estate trends. Stacey C. Tyler is an associate at Lowenstein Sandler LLP. She handles a broad array of real estate transactions, including acquisitions, dispositions, development, leasing, financing, hospitality deals, and publicprivate partnerships. Stacey served as an Intern to the Honorable Carolyn E. Demarest of the Kings County Supreme Court, Commercial Division. > TECHNOLOGY COMPANY OFFICE LEASES.